A former weekly newspaper editor has died at the age of 65 – the day after his wife passed away. Tributes have been paid to Mike Robinson, left, who until recently worked as a journalist on newspapers in Shropshire and North Wales. 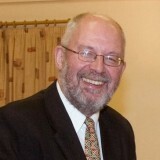 Mike spent 21 years as editor of various titles including the South Shropshire Journal, Mid Wales Journal, Hereford Journal and Ludlow Journal, having joined the Shrewsbury Chronicle in 1988. In more recent times he worked on the Oswestry & Border Counties Advertizer and the Whitchurch Herald. Mike died last Friday after a short illness, a day after his wife Lesley passed away. He had begun his career on the Advertizer and also spent 13 years as deputy sports editor on The Leader, in Wrexham, during his career. Nick Broadbent, who was Mike’s sports editor at The Leader, described his death as a “tragedy”. He said: “He was a lovely, humorous and entertaining person who I spent some great times with. A keen sportsman, Mike served as chairman of Oswestry Cricket Club and was a founder committee member of the Wem Sunday Football League. Former Shrewsbury Chronicle editor John Butterworth said: “It is such sad news, Mike was a great professional journalist and a great character who will really be sadly missed. “He did excellent work with the cricket club and what a lot of people don’t know about is the excellent work he did with the disabled cricketers. Mike and Lesley are survived by sons Mark and Paul.